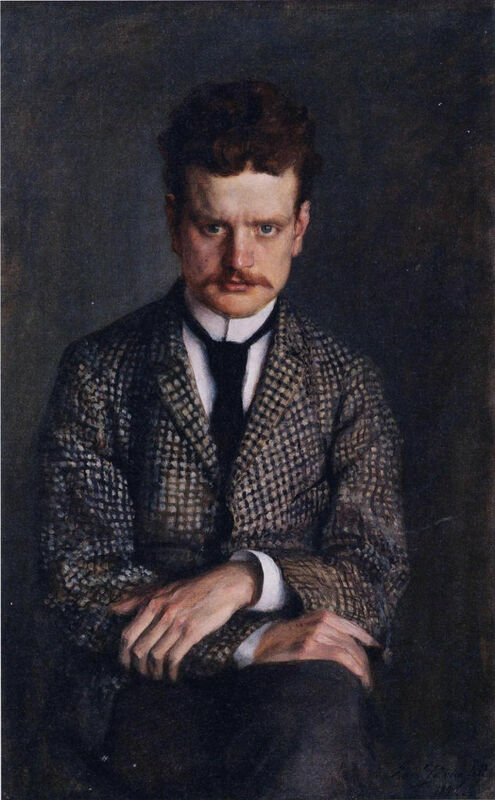 Sibelius first conceived the idea of writing a violin concerto in 1899, at a period of great musical creativity and productivity for him, when he was already becoming famous as a composer. He told his wife Aino, "I have got wonderful themes for the violin concerto". However, some three years were to pass before he began to work in earnest on it. In December 1903 the composer was able to tell his friend and mentor Axel Carpelan that he had completed two movements of the concerto, but that the orchestration of the third movement remained to be done. At the start of 1904, he was working intensely on it, playing ideas all day and night on his violin. Aino wrote to a friend: "Jean has been on fire all the time (and so have I!) and this time there has once again been an 'embarras de richesse'. He has such a multitude of themes in his head that he has been literally quite dizzy. He stays awake all night, plays incredibly beautifully, cannot tear himself away from the delightful melodies - he has so many ideas that it is hard to believe it. And all the themes are so capable of development, full of life""
The first performance took place on 8th February 1904 in Helsinki. Sibelius had originally dedicated the concerto to the violin virtuoso Willy Burmester, who had agreed to première it in Berlin. However, Burmester was not able - or not willing - to travel to Helsinki, and instead Sibelius engaged Victor Nováček, a Hungarian violinist from the Helsinki Institute of Music. This turned out to be a disastrous change - Nováček was a teacher rather than a performer, and furthermore the concerto was finished too late for extensive rehearsal. According to Carl Lindelöf, the leader of the orchestra, Nováček was slow in the rehearsals and complained about the difficulty of the fast passage work. The critics received the work coolly, unfairly accusing Sibelius of resorting to conventional virtuosity. In consequence Sibelius decided that he had to rewrite the work. He wrote to Carpelan, "I shall remove my violin concerto; it will not be published until two years have passed. The first movement must be rewritten, the same goes for parts of the andante". The new version was premièred on 19 October 1905 with Richard Strauss conducting the Berlin Court Orchestra. Sibelius was not in attendance. It did in fact retain much of the original work, but was shorter and more focused. In the following decades the revised concerto slowly became more popular, and it was finally recognised for the masterpiece it is in the 1930s, through the performances of Jascha Heifetz. It went on to become the most performed and recorded concerto of the 20th century. The concerto contains many striking innovations. Sibelius believed that a soloist standing on the platform waiting to play was not a very interesting sight. Instead he lets the soloist introduce the main melodic idea at the start, and to play the whole of the development section of the first movement as a cadenza. Apart from a few short orchestral tutti, the soloist plays throughout, making it a very demanding work. The concerto has a distinctly symphonic character, with individual instruments or groupings of instruments becoming important voices rather than simply accompanying. Perhaps the most novel feature is the use of false harmonics by the soloist in the final movement, which gives a strange other-world character to the melody. The concerto has passages of exquisite beauty sometimes contrasted with dark brooding harmonies, and it ends with an uplifting and energetic dance finale. Sibelius' violin concerto was performed by the Portobello Orchestra on the 2nd December 2017. The soloist was Iain Gibbs, and the orchestra was conducted by Sam Jones.